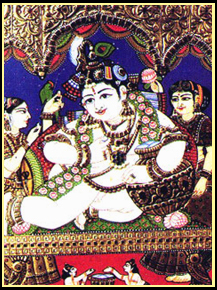 The original temple and the Lord on whose praise the Azhwars have sung the Divya Prabhanda are not in existence now. The temples at Gokul and Purana Gokul came into existence at a later time. The temple at Purana Gokul , on the banks of Yamuna has Nandagopan, Yashoda, Balaram and Balakrishna as deities. Accessibility About 4 miles south-east of Vada Muttra. This Divyadesam is found 8 kms away from Mathura.To reach this Temple, one has to travel 3 miles from Mathura and cross the bridge on the Yamuna river. After that, travelling 5 miles in the bus, from there, we can reach the Temple of Gokulam.